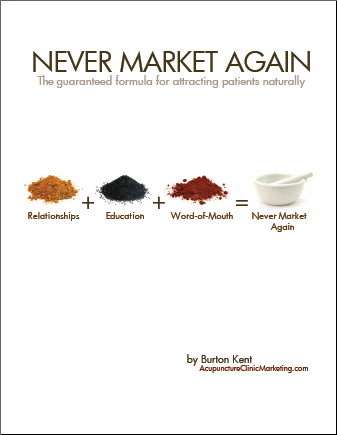 My name is Burton Kent, and I've worked with dozens of acupuncturists on their advertising and marketing. Experience led me to a system that allows you to avoid advertising almost completely, and never have to "sell" yourself. If you want to get patients without any of that wasteful advertising/selling/marketing stuff, this may be the most important thing you've read this month. There's one thing that separates the most successful practitioners. Just one thing that separates a successful practice from a closed clinic. That one thing is... referrals. For most practitioners, the single biggest source of new patients... is referrals from old patients. This is also true for many small businesses. Everyone from accountants to mechanics get referrals - and they get them more reliably than AOM practitioners. Why don't referrals work as well for acupuncturists? Simple. Usually people know when a referral is needed. People know they need a mechanic or a hairdresser. This makes the referral almost automatic for them, but not for you. People almost never know when they need an acupuncturist. Referrals just don't happen as often for AOM practitioners. Nowhere near as often as they should. Before I read "Never Market Again" I tried out a lot of marketing ideas. But nothing really worked all that well. I wasted some money on newspaper ads which produced a few calls, no new patients, and a few thousands wasted away. I also tried an e-mail newsletter, which on its own is not that great and a lot of work. Just before I read your book, I planned a direct mail. And I spent too much money for the returns, but interestingly enough I got 3 new patients (out of 4 calls from over 1000 postcards). I got to the point that I was even not that excited when someone called me because I would get into a discussion about Qi, blood, heat, and cold knowing they would give me a funny look. Then we would discuss money and I would never hear from them again. I was feeling so frustrated, I was considering what else to do with my life. My practice wasn't growing like I need to be to make a living, and I have another job to make ends meet for me and my family. It's been less than a month since I read "Never Market Again." It has been a great month. I have gotten 7 new referrals. One of the funny things was I just thought about the thank you system, and put the idea into the world, and patients began referring their friends, it was great. Then I reinforced it with the new patients. So a patient from last summer referred her daughter, who referred her husband, who referred his father. I have only put a small part of this system in place, and can't wait to see what the whole system does for me. It's inexpensive and it works. I am not sure how to put this, but it changed my life. I read it just at the right time. Even so, you are receiving referrals. Maybe not as many as you'd like, but they happen. It's great when it does - there is no better form of "marketing." It can take years to really become established as a practitioner and reliably get referrals. You've probably heard the conventional wisdom - it takes five to seven years. If you're relying on accidental referrals, that's about right. But what if you could have referrals happen on purpose? How easy, effortless and fun would it be to have all the patients you wanted? Not just any patients. Good patients. Patients who already have heard good things about you. Patients who have heard about your skills and believe you can help them. Patients who follow through on your treatment protocol. Patients who aren't very concerned about how much it's going to cost. Sounds great, doesn't it? But how do you make it happen? That's what confused me for a long time. I helped dozens of practitioners with their marketing before I figured this out. I found that the biggest oversight in most practitioners' marketing was marketing to existing patients. Studies have shown that an existing customer (or patient) is seven times more likely to do business again. When it comes to acupuncture, they're even more likely to see you again. Past patients know you, and usually are very satisfied. They know acupuncture and Oriental medicine work � or at least worked for their condition. They don't have to get over any needle fears and they're comfortable with you. You've already done the medical history and most of their intake. These past patients would make perfect current patients... if only they realize that you can still help them with other conditions. Problem is, most people don't realize just how much AOM can treat. They see acupuncture and herbs as a last resort instead of an effective and comprehensive medical system. So how do you bring these perfect patients back? How do you make inactive patients active again? Educated patients come back for far more conditions, simply because they realize you can treat them. That's why I had my clients focus mostly on educating their patients. This earned them many repeat visits from old patients. But something strange happened. Referrals shot up. Patients started referring a lot more new patients. Not some. A lot. At first we didn't know exactly what was happening. Reminding patients you exist will cause more referrals. But this was more than that. As it turns out, educated patients make the best referrals. They make the most referrals. And they ENJOY making referrals. So education is one key to getting referrals. It was the first step in discovering the Never Market AgainTM system. I knew I was onto something, but little did I know there are two more ingredients to having your patients do your marketing for you. What made it possible to find the other ingredients to reliable referrals is that I consulted with both successful and less successful practitioners. This allowed me to examine the differences. I wanted to know. What were the most successful practitioners doing that the others weren.t? If you have good relationships with your patients, they'll tend to refer. If you educate your patients, they'll be more persuasive in making referrals. They'll know of more conditions that acupuncture and Oriental medicine can treat. They'll also be able to explain why it works. If you take special care to maximize word-of-mouth, it will simply happen more often. Like I said, obvious. But what's not so obvious is how they all fit together as a system. As a complete system, the whole is greater than the sum of its parts. Improving one area automatically improves the other two. Having good, lasting patient relationships allow you more time to educate your patients. And of course good relationships also lead to word-of-mouth. Patient education makes your patient relationships stronger. They come to see you more often because they understand more about what you can treat. Also, because they are more educated about what you do, they are better able to talk about you and refer people to you. Word-of-mouth brings you more patients to educate and have relationships with. There's also a few things you can do to make the people who talk about you even happier because they talked about you. The effects of all this is not additive. It's multiplicative. It's obvious how the system works when explained this way. However, like Chinese Medicine, knowing the overall system is just the start. Having a superficial understanding is like practicing "medical" acupuncture. It can work � but without true understanding, it's just not as effective. The two things that get people talking about you and referring (page 44). Also the one thing that will stop referrals cold (pages 51-53). A story about my auto mechanic that will help you realize that people are HAPPY to be asked for referrals — if you ask at a certain time. You'll never think about asking for referrals the same way again. Pages 47-48. One practitioner tried asking for referrals this way. The patient tried to take the whole stack of brochures. Cute email on page 48. The one thing desperate patients want from you more than anything else. If you don't give it to them, they probably will avoid you, even though they need you. See pages 62-63. The two main audiences for your materials are new patients and existing patients. There is a difference - be careful with new patients. What to consider is explained on page 85. An automatic way to educate patients online. You set it up once, but patients experience it as an ongoing, educational discussion. (Set it up now, and reach new patients 3 months, or even 3 years from now. It literally works on autopilot.) (Details in the bonus manual "The Faucet"). I just got an incredibly positive response from asking a referral like you recommend - I came up with my own twist that fits me. My patient (who now thinks I'm cooler than ever) is about to go home and sell his friend on me. And the best part is that I mean every word of how I asked for referrals. I found a way to make it feel natural, like talking to a friend, not like selling. Call me satisfied. I'm so proud that I pulled that off without sounding sales-y AND making a current patient extra happy with me. Burton, you just earned the cost of your book. 'Cause even if it doesn't work with this particular case, I strongly suspect it'll work with others. Have a fabulous weekend! Thank you! Acupuncture is often only sought out as a last resort or final hope. What to tell your patients so acupuncture and OM are their first choice instead. (This secret also helps your patients make many more referrals.) See pages 36—37. You've spent at least $50,000 getting your degree — probably the most important investment you'll make in your life. The only way to make this huge investment pay off is to use it. If you're not using your skills, if your clinic isn't full, your time and your degree are being wasted. Even worse, people that need you don't know about you. Doesn't it make sense to invest a little more to get the full value of your degree? Never Market Again is a small cost when compared to your degree. However, you can make the manual effectively free for yourself — I guarantee it. Applying just one concept from the manual will certainly get you at least one new patient. That patient's very first visit will be enough to pay for the manual. Repeat visits will pay for the manual again and again — meaning it ends up being better than free for you. I'm certain you'll get far more than one new patient. But that's not good enough for us. You must really be satisfied. If at any time within the next 8 weeks you don't feel like Never Market Again is going to easily get you at least 20 patient visits over the course of the year — that's 20 times what you would pay for the manual — simply get a refund. It won't bother me if you do — I'll be glad that you at least took a look. You'll get at least twenty times the value of the manual — just this year. Next year will be even better — because the system improves with use. But in order for that to happen, you have to get started. You can be reading the manual in five minutes — I'm told it's an easy read, and very clear. So start now. You'll be glad you did. I guarantee it. P.S. You'll also get the manual "The Faucet" as a free bonus. Never Market Again is all about using word—of—mouth and relationships to build your practice. However, there are some advertising methods that are cost effective for getting more patients. They cost money, but they're still an investment — the money you spend will be paid back many times over. Even better, don't need ongoing maintenance to pour patients into your clinic. That's why I named it "The Faucet". Give patients your materials so they can refer people, but have this discussion first. It ensures most brochures will get delivered and you'll be talked about. Otherwise they'll probably throw them out. Pages 49—50 explain. Four stages of realization all patients must go through before they seek you out for treatment — every time! Most word—of—mouth only reaches the second stage, then dies. Pages 58, 59 and 60 explain how to make it work. You will get new patients referred by old patients. There's a way to make both of them happy, and refer more. Powerful strategy costs about $1—2, takes about 5 minutes of your time, and is explained on page 57. So many of us cringe at the thought of marketing — like it's a dirty word. This holds our profession back. The book Never Market Again shows a different approach. Burton is a true master at teaching us how to better communicate and educate more people, so that they can in turn, help us to help more people. Almost all practitioners know that most patients come from referrals from other patients. The system in this book shows how to maximize referrals without being "unethical" or "pushy". Instead, this method shows you how to raise awareness while improving your relationships with current patients and new patients. Never Market Again is one of the absolute best resources for those who want to learn how to effectively market your acupuncture practice. I recommend it to anyone who wants to use improved communication and relationships to build their practice, instead of traditional marketing. Why competition is a good thing and will probably will help you get more patients, not less. See pages 88—90 to find out how this is possible, and why you may want to partner with your "competition" to advance OM. Legal drugs kill more than 10 times more people than illegal drugs, and are probably the leading cause of death in the United States. By practicing OM, you're saving lives. Find out why on pages 95—99. How to write your own marketing and advertising materials easily. Writing was agonizing for me, but no longer. It can be easy. Three painless methods that work on pages 85—87. It's been estimated that a headline is at least five times as important as the rest of your brochure or promotional material combined. Pages 83—84 explain why, and see several examples to use as templates/idea starters. (We hate spam and would never do it to you. If you're still not sure, remember the guarantee. If you're not happy anytime within the next 8 weeks, just request a refund. No hard feelings, and I'll thank you for taking a look. Get free information about having all the patients you need . Leave checked for free chapters and other information about Never Market Again — a book on easily getting more patients. The book, Never Market Again is simply the best way to get more patients. No need to sell or spend a lot of money — your current patients will bring you new patients, guaranteed! The second best way is to have a website. Just one or two patients will pay for the site for a full year. Since most sites get that many a month, it pays for itself, and then some. Usually you'll have to pay hundreds of dollars to have one set up, then pay $10 a month. Even then, it costs money to make changes, add photos, or generally make your website fit you. Acupuncture Clinic Websites currently costs just $30 a month. They're Not Even Licensed Yet! Can You Possibly Compete With Free??? Jann Sumner on They're Not Even Licensed Yet! Amy Lu on They're Not Even Licensed Yet! Juliet Austin on Can You Possibly Compete With Free??? Burton Kent on Am I In Trouble Now?